A versatile OD unit with interesting circuit components. 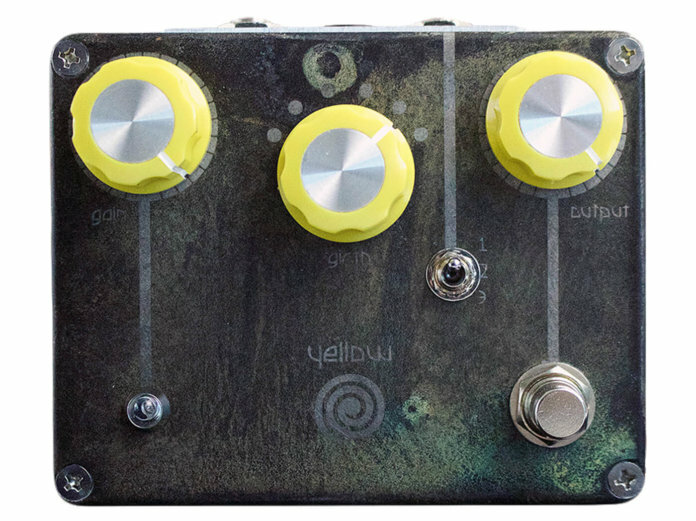 Spiral Electric FX has debuted the Yellow Spiral Drive, a dirt box that aims to be an all-in-one overdrive pedal. Designed by brand founder Tom Cram, the Yellow Spiral Drive aims to serve a wide range of functions, from an “always-on” tone sweetener to clean/dirty boost to low-mid gain distortion to “lead shred-o-rama”, as Spiral Electric FX claims. The Yellow Spiral Drive sports a three-way toggle to either blend the N2 with silicon or LED diodes, or select the N2 on its own. The Girth control, on the other hand, is a six-way tone selector that adds low-end – or ‘girth’ – but retains highs. Apart from these, the pedal also has your usual gain and output controls. Spiral Electric FX also adds that the new stomper is very touch sensitive, going from “chime to grind” just from adjusting pick attack. Retails at $249. More info at spiralelectricfx.com.